The Hudson River School of art has been my favorite fine art genre since I studied founder Thomas Cole’s stunning Voyage of Life paintings as a young art major in school. Such deep, dramatic, and luminous paintings these artists produced in the mid to late 19th century! As a matter of fact, their paintings were so wildly romantic and lustrous that a new genre spawned from their works: luminism. Luminism seemed very appropos for the period– a time of exceptional industry and invention but also a time of rising utilitarianism with the tragedies of the Civil War punctuating the century. These artists brought us back to the simple treasures of nature, where man is at peace with God’s good creation. Far from exalting nature as a Shangri-La type of deity like Voltaire so erroneously extolled, these artists emphasized nature as the beautiful, inspirational backdrop for peace with God and other men, celebrating with art the psalmist’s cries, “Day unto day utters speech, and night unto night shows forth knowledge” (Psalm 19:2). Many of the Hudson River School paintings depict clear scenes or illusory hints of Biblical themes and events. I love the Voyage of Life series because of the stories each painting tells, that of a man eventually finding his faith in God and the joys of heaven after a tempestuous life of sorrow. It’s simply…. beautiful. Frederic Edwin Church was a young student of the illustrious Cole, staying with Cole’s family in Catskill, NY, and studying painting. 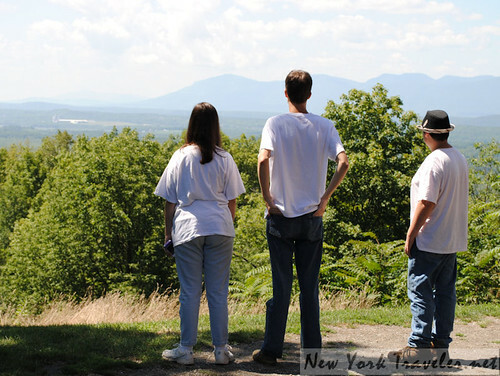 This area of New York State bursts with inspiration, as it has been the birthplace of such legendary notables as Rip Van Winkle, Uncle Sam, and numerous other tales of fact and fiction. Church was born in 1826 in Connecticut. Early on, his artwork showed immense talent. In 1848, he became the youngest associate of the National Academy of Design, an honor he still retains. Church married Isabel Carnes in 1860, and the couple purchased a parcel of land with magnificent views overlooking the Hudson River, the Catskill Mountains and the Taconic Hills. CLick the photo to go to my Flickr website for a larger view. The couple built a simple little cottage that they named “Cozy Cottage.” The structure still stands, but it is not available to tourists. Two children were born early on to the young couple: Herbert in 1862 and Emma in 1864. 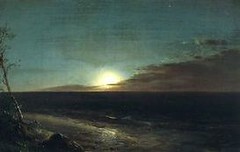 Church painted two beautiful works after the birth of the children: Sunrise for Herbert and Moonrise for Emma. 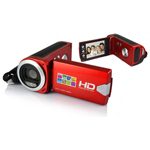 (See the two small images at the beginning of this post). Tragically, both children died in 1864 from diphtheria, and the parents never completely recovered from the horrible loss. Even after four more children were born to the Church family in later years, Frederic hung his Sunrise and Moonrise paintings in the family room, next to the fireplace where he often brooded and mused. The family traveled all over the world, returning home with crates crammed with furniture and knick-knacks. 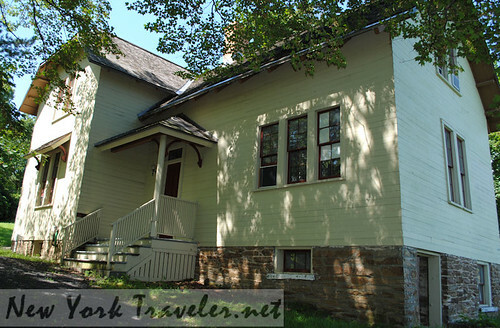 Construction of a new home, perched high atop the mountain, had begun in 1867. 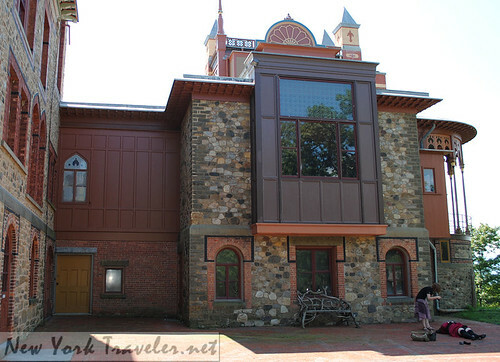 Church designed the home himself in an eccentric mish-mash of Persian, Moorish, and Victorian styles. The home is colorful and lively. I just adore the design. 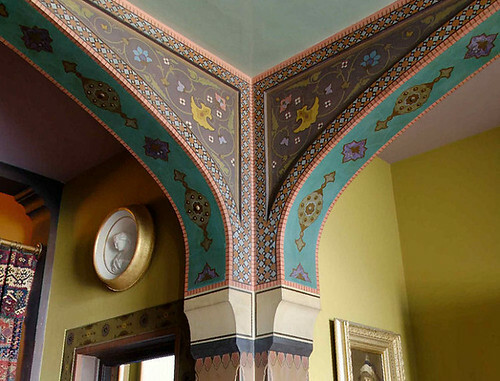 Photography is strictly forbidden in the house, so I nabbed a few photos from the www.Olana.org Historic Site website to give you an idea of the interior of the house. 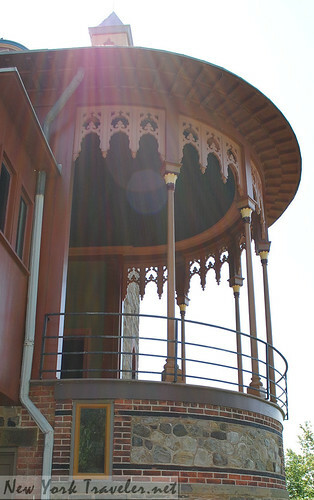 The home is furnished with all the Churches’ possessions from all over the world. Church’s paintings saturate the decor. The dining room was the only room not filled with Church’s works; rather, it held dozens of paintings from other men all around the world, pigmented vignettes of his travels. I identified several Dutch masters’ works and a few Italian and German paintings, too. Scholars have linked the name to a translated volume of Strabo’s Geographica, a Christmas gift from Isabel to Frederic. Strabo’s publication describes the geography of the Roman Empire and references the city “Olane,” as one of the “treasure-storehouses” on the Araxes River, which offered a view of Mount Ararat, where Noah’s ark was said to rest. It is likely that the Churches appreciated the associations this name had their own Persian-inspired stone “fortress” situated high above the Hudson River with majestic views west to America’s promised land. The house is lovely, simply exquisite. Our tour guide, Ellen, was filled with interesting information about the home and the Churches. I was delighted that Mark Twain often visited the home, reading portions of his works for after-dinner entertainment. The family also gave small skits or plays on the large wooden landing before the stairs, a heavy colorful tapestry serving as the “curtains” of the stage. The Churches lived here until the couple died in 1900. Frederic willed the property to his youngest son, who married and lived at Olana for the rest of his life. His widow remianed here until 1964, at the age of 96. After her death, Olana narrowly escaped the auction block. 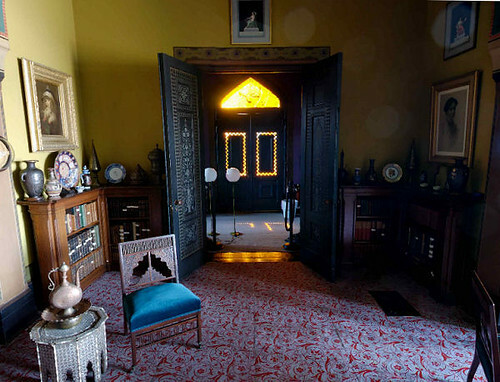 The widow willed the home to a nephew, who didn’t like the house and wanted to sell all its contents at auction. A group of motivated people scrounged financial support to purchase the home. 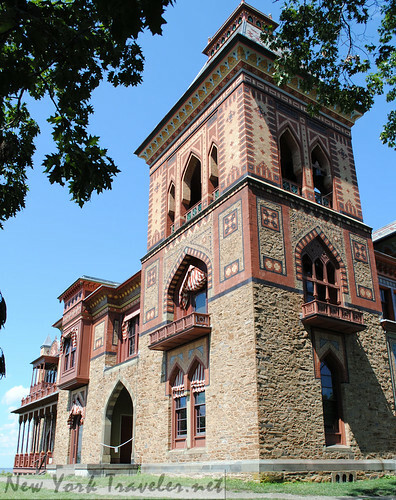 New York State pitched in, and Olana was preserved intact and deemed a state historic site. Most of the home is restored, but the children’s nursery, servant’s quarters and kitchen are not and therefore unavailable for viewing. This was a great disappointment, because I like seeing the kitchens and nurseries best of all in historic homes. I have so much more to tell about the home and our visit, but it would fill books. The best thing I can say is go see the house for yourself. You won’t regret it. The 250-acre property also features numerous trails for hiking. Picnic tables and benches provide repose for visitors. 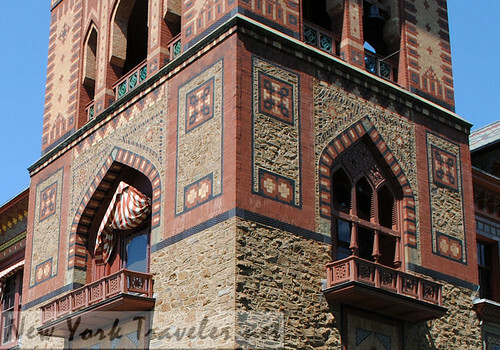 You can see more photos of Olana at my Flickr photo page here. Wow, looks amazing! Interesting history too… When you are banned from photography, that’s a good reason to go undercover. 🙂 They don’t allow footage on rollercoasters either, and I only got in trouble twice. 😀 It might be worth the shot. Thanks for the comment, Mike! There was no way I could have sneaked in a shot– the tour guide watched us like a hawk! It was a great trip! We happened to go there on a beautiful day, and the view was more stunning than any other place I can remember. It is certainly obvious why a great landscape artist would want to live there! And how much of a landmark the building was; the style of structure is just so unique to this country that even from afar, we saw this large house on top of the mountain and said, “Look! 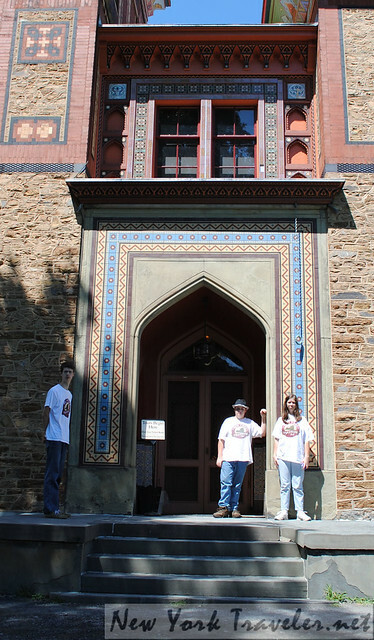 There’s Olana!” It’s certainly one-of-a-kind! The outside, too was beautiful. 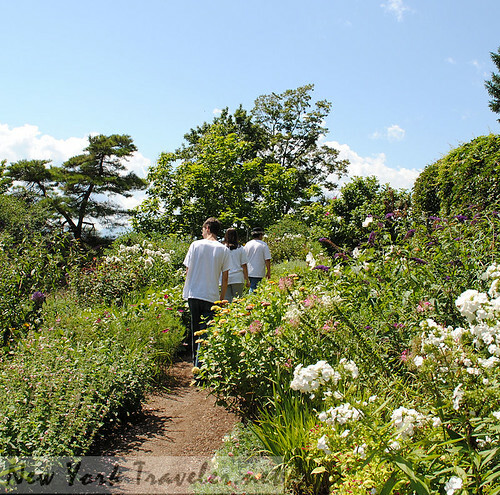 If you like to see historical homes and learn some family/local/national history, and then have a picnic outside or take a walk through nature, this place is bound to be an enjoyable visit– not just for art-lovers! OH! I forgot to say that it’s pretty obvious that Thomas Kincaide was very influenced by luminism, yes? Seeing these Hudson River guys works it’s very apparent that Kincaide was heavily influenced by them.